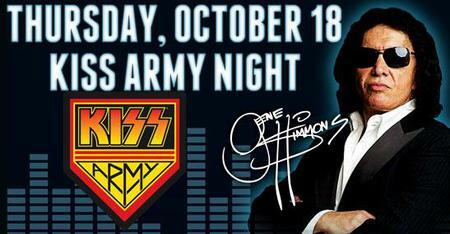 KISS bassist Gene Simmons is hosting KISS Army Night at the first annual Rocktoberfest at L.A. Live. The festival is presented by Rock & Brews, the restaurant concept founded by Simmons with restaurateur Michael Zislis and concert promoter Dave Furano. Described as “a rockin’ California tribute to the two-centuries old Bavarian tradition,” the seven-day event includes local, national and international beers along with Oktoberfest cuisine, live entertainment and special celebrity guests. Held at Nokia Plaza – L.A. Live, Rockterfest begins with an opening charity gala October 15 and wraps up with the Craft Brew Festival on October 21, featuring more than 50 different craft beers and breweries. A portion of the proceeds from the Craft Brew Festival will benefit The Grammy Museum at L.A. Live. General admission tickets begin at $107 and include $60 worth of food and beverage vouchers, as well as a commemorative drink stein.VIP tickets are available ranging from single VIP tickets for $261.50 to seating at the “Hall of Fame” VIP table for eight. You’ll need to call for “Hall of Fame” VIP pricing but we can tell you this special package comes with tons of perks such as red carpet access, eight tickets to see the Lakers vs. Kings game October 21, two nights in a penthouse and the chance to jam onstage with Simmons. KISS Army Night, which takes place October 18, will feature live entertainment, German beers on tap and a selection of Wolfgang Puck’s Oktoberfest dishes. Simmons will perform at an all star jam session at 8:30 p.m. You can expect other KISS band members to be in attendance. General admission tickets, including a commemorative drink stein, are $24.75. KISS will release their new album, “Monster,” on Tuesday.